This is an absolutely adorable breakfast and after much fuss was an absolute hit with the kids! It was rather early in the morning and it was an impulsive breakfast idea so the quantities aren’t very professional here but you get the idea 🙂 I know it looks like a lot of fruit but eaten with the peanut butter will slow down the release of fructose into the system so no hyper go go kiddies after this one! In a bowl mix together thoroughly the peanut butter and the powders, adding tiny amounts of water at a time if it is too stodgy you want the consistency of dough. Slice the banana into disks, try and make them as even as possible. Wash the grapes and then slice them into either eights, quarters or halves depending on the size of them. You want them to be smaller than the banana. 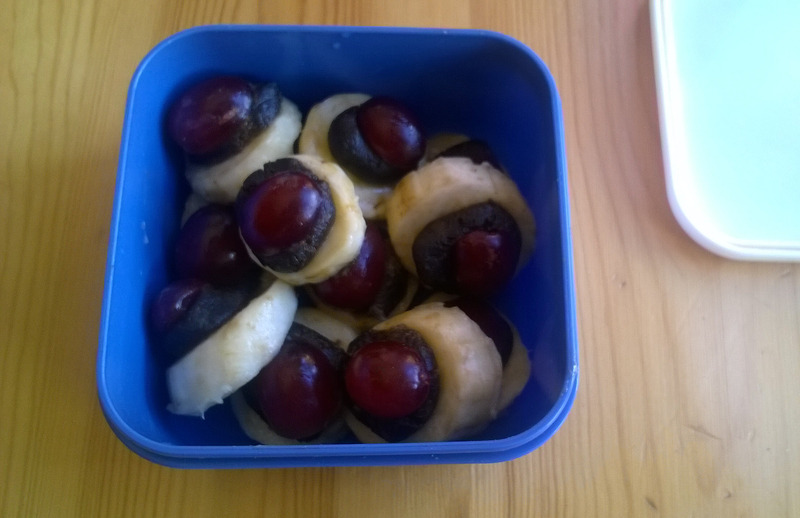 Roll the dough mixture into little balls and top each banana. Add the grape pieces to the tops. Bless with love and serve! Hopefully your children will love them as much as mine did. If you have any left over, to stop the bananas from browning spritz a little fresh lemon juice over them (it really works!) and pop them in the fridge for later, they are yummy cold too! 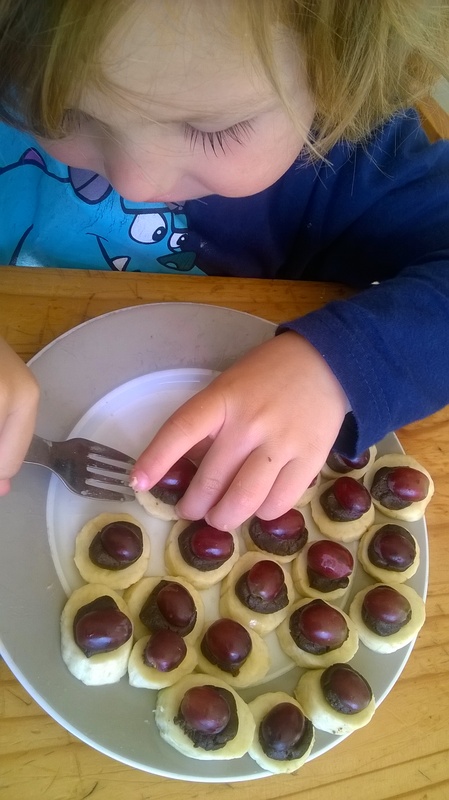 Please feel free to link to this recipe if you try it, I would love to hear what your kids thought and maybe see some pics? Have a fabulously delicious day. Peace.